The environment [E] is designed (stage, lights, props, costumes, sound), and the animal [A] is conditioned (through training, practice, and exposure to the choreographic design of both works, which is essentially a sequence of ‘proposed goals/behavior’ or ‘available goals/behavior’), so that we can see what E affords A. As this practice continues (of rehearsal and performance), we see how E continues to condition A, and, intentionally or otherwise, how A reshapes or redesigns E, as well as the mode of conditioning. Three Muses was a program of two newly commissioned works by Idan Sharabi and Doug Varone accompanied by two existing pieces from my repertoire, including one by Sharon B. Moore alongside one of my own signature solo works. In a classic muse-choreographer relationship, the muse is a dancer whose character, physicality and powers of interpretation unleash new depths of artistry from the choreographer. Ultimately, the muse helped define the choreographer’s identity. As a dancer, I have found an inverse muse relationship with certain choreographers and curated the program to capture such relationships. The Heist Project involved two commissioned works by Sharon B. Moore, Idan Sharabi and a partnership of Emio Greco, Pieter Scholten, and me. I created Heist as a metaphor to a jewel heist, which must be meticulously imagined and designed, but ultimately achieved through spontaneity in response to the unfolding action. 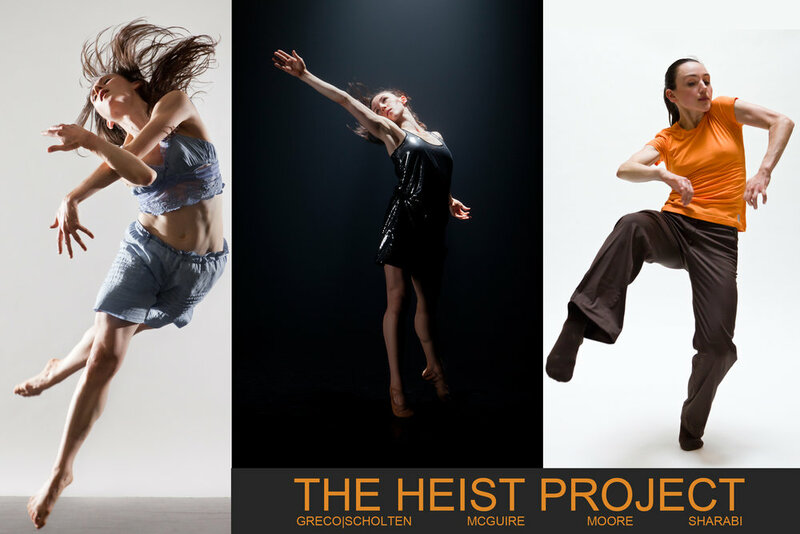 Heist investigates the value of awareness, sensitivity and reactivity to the present while pursuing the choreography - a well-known, pre-determined form or plan. The heist theme was applied to the overall project and the individual dances. Though necessary spontaneity and reactivity are essential aspects of live performance, they served as the backbone of these choreographers' work by piquing curiosity, driving creative process and shaping artistic identity. The heist theme propelled each choreographer in very different ways. The Desert Island Project involved three newly commissioned works by Kate Alton, Andrea Miller and Idan Sharabi as well as a new creation of my own. The project explored self-diversification, autonomy, resourcefulness and empowerment of the individual by exposing me (the performer) to chosen influences (my collaborating choreographers). I then stranded myself alone onstage 30 minutes prior to the start of the performance. I coordinated the sound, video projection and lighting design to automatically run through to the final bows.